For some Shooting Fun in Jackson Hole, Wyoming, check out the Jackson Hole Shooting Experience! The Integrated Benelli M2 XRAIL – Lynn Sherwood’s New Favorite Thing! Shot Show Industry Day at the Range. Big Boys. Big Guns. Big Testosterone. Oh yeah: and estrogen. Bring on the estrogen, I say, and I hope you’ll join my journey to pure bliss as I share with you a bit about my new favorite thing: the Integrated Benelli M2 XRAIL. 26 Rounds of pure semi-automatic shotgun fun! Without the comforts of her 3-gun speed loaders, Cyndi painstakingly loads 26 rounds; yes, 26. One main tube and three auxilliary tubes are finally full. What a woman. Now let’s see if I can mount this puppy to my shoulder. Piece of cake. Mount; bang. Bang, bang. Oh yes, and more BANGs….. When the last shell exits the first tube, the entire assembly rotates (similar to a revolver), feeding the next shells from the following tube into the chamber to fire, one by one. Bang, bang, bang… Oh, now I’m starting to feel the weight of this beast. Never a quitter, the thrill of emptying 26 rounds in seconds with an other-than-full-auto firearm beckons me to plow forth. Lynn Sherwood with Cyndi Roth, Owner – Integrated Benelli M2 XRAIL system by RCI. Serious Shotgun Fun. Staring directly west in the Las Vegas desert at 4:18 pm is brutal if one is looking for tiny clay disks flying through the air in various directions from centralized machines. Bring it on. Bang, Bang, bang. Wow, this thing is getting heavy. Now, with 5 feet and 9 inches of height and a body frame able to strap half of a 6 point elk accross my shoulders and back, most would not describe me as a petite lil’ lady. I’m ‘that which doesn’t kill me makes me stronger’ kind of fit. After 20+ rounds, my resolve in tact and my upper body nearly collapsing, my drive continued with the excitement of this sleek concept keeping me driven. Flinching on an empty chamber (serious sign of my physical fatigue! ), I still needed more. I needed to handle the gun again to know first-hand how to load and when I’d know to turn the cyliner with the auxiliary tubes; how it felt in my hands prior to loading; how Cyndi and her husband Mark, of Roth Concept Innovations (RCI) came up with this idea; I needed to know everything about everything about this firearm. 3-Gunner Mark Roth invented, designed, patented and trademarked earlier versions in 2006 to help alleviate the ever-present capacity problem on the shotgun platform in competition. With market testing and a series of revisions, this integrated system rolled out at the 2010 Shot Show for public consumption. A.men! While my shooting passions typically point me primarily toward the pistol and rifle disciplines, this product has taken my breath away and my thoughts about my favorite Shot Show products for 2016 revolve around this Integrated Benelli M2 XRAIL. My husband said to me once after I purchased my custom turquoise and purple AR-15s and accessories at last year’s Show, “Lynn, could you just want shoes like other women?” No ~ my birthday’s coming up and the XRAIL’s on my list. Bring on the fun and the innovative products stemming from the needs of entrepreneurs, and long live Shot Show’s Industry Day at the Range! 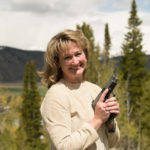 Lynn Sherwood is co-owner, business manager, and a senior lead shooting instructor with High Caliber Women (TM) and the Jackson Hole Shooting Experience. 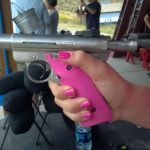 After overcoming a life-long fear of guns, she now trains women, families and corporate groups in the safe, educational and FUN use of firearms daily in Jackson, Wyoming, and travels teaching nationwide sharing her passion for the shooting sports. She is an NRA certified Instructor and Training Counselor in Basic Pistol, Rifle, Shotgun, and Refuse to be a Victim, and is a Chief Range Safety Officer, competitive shooter, and published contributor for various outdoor and shooting publications. Lynn and her husband, Shepard Humphries, enjoy playing with their yellow lab, Remington, when at home in Jackson Hole, Wyoming. Learn Gun Safety ~ Even if you never intend to pull the trigger! Lynn Sherwood Interviews Gia Verrati of Tactical Barbe at Shot Show 2016! Next post: Learn Gun Safety ~ Even if you never intend to pull the trigger!